Physical medicine and rehabilitation emphasizes the prevention, diagnosis, and treatment of disorders – especially as they relate to the nerves, muscles, bones, and brain – that produce temporary or permanent impairment. Our practice treats injuries or illnesses that affect how you move with a focus on musculoskeletal care. General musculoskeletal care begins with a detailed evaluation by one of our team of spine experts (MD or DO, Doctor of Physical Therapy, Doctor of Chiropractic ) – depending upon your condition and either your referring physician’s or your personal preference. Your evaluation will be followed by a highly-specific manual therapy, selected exercises and education in self-management of your condition; all designed to correct the underlying cause and prevent future injuries. You’ll see dramatic results quickly. 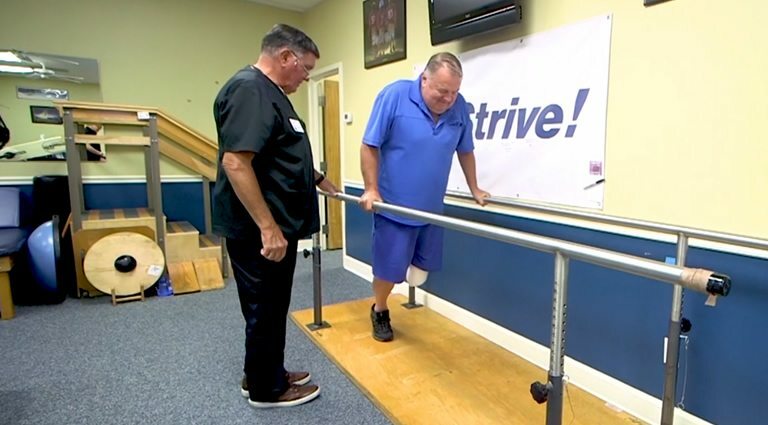 Our integrated practice includes comprehensive physical rehabilitation services provided in-house by Strive! Physical Therapy Center. Our Doctors of Physical Therapy are experts in the nonsurgical treatment of spine and joint injuries and are nationally recognized. This manual therapy approach includes focused exercise and conditioning to treat the current condition and prevent future injuries. Our therapy team takes pride in being experts in their field. They will help you get back to life and work – quickly and safely.